RN Blog — Robot Ninja Co.
We Solemnly Swear We Will Do a Good Job! Back in April Robot Ninja won the pitch for Bloomsbury's 20th anniversary of Harry Potter. Bloomsbury wanted to curate fans’ top twenty moments from the entire book series and put them into a video for fans, by fans. The biggest design challenge we encountered was that the client originally had a 1x1 video ratio in mind, so it was viewable on both mobile and desktop. We wanted the fans watching to be immersed in a full screen experience of the video wherever they were viewing, so we worked on a solution with Tram-Anh, the head of digital marketing at Bloomsbury. We designed the entire video in 1920x1920 with the vision of being able to create a 1080x1920 vertical solution for mobile and a 1920x1080 horizontal solution for desktop. This way we wouldn't have to crop any of the main design points (which is commonly seen in video for mobile) so it would work in both formats. This design process also helped at the end of the project when it came to creating looping gifs, optimised as 1:1 aspect, for each individual moment, so that fans could have the option to share their personal favourite. Robot Ninja assisted in organising the moments into an order that would take the viewers on an emotional rollercoaster. 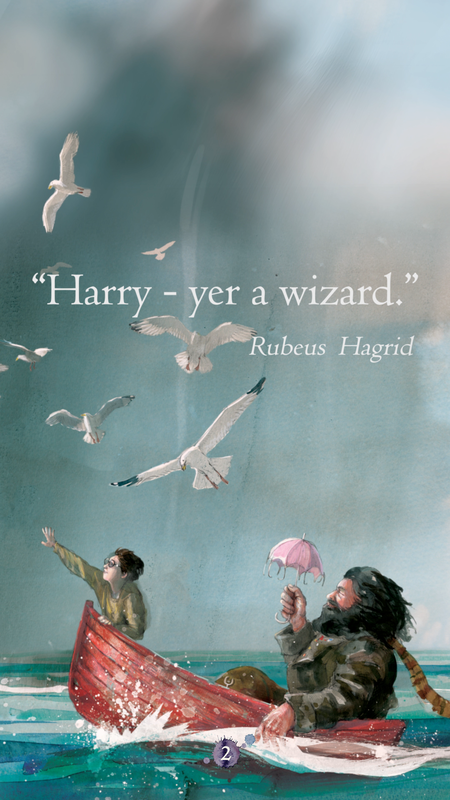 We used some original illustrations by Jim Kay from the illustrated editions of The Philosopher's Stone and The Chamber of Secrets. We both worked on animation while Anthony took lead on creating the (ambitiously pitched) Cinema 4D elements, and did an incredible job! We selected the music and I cut it together to work with the animation and flow of the video, and also took the lead on sound design and mixing. The design process went to plan and we delivered an immersive, vertical, mobile version for Facebook and a horizontal, cinematic, version for YouTube. In its first 24 hours online it received 6 million views on Facebook alone. Fans were happily commenting on how the video had them in tears of joy and sadness. It was such an honour to be involved in such a prestigious project and moment in history.